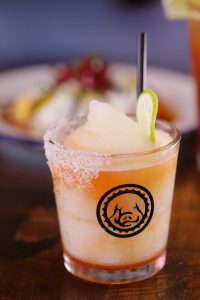 2019 is the Year of the Pig, especially for Cochino Taco. The Englewood taco joint, named after the Spanish word for the animal, will open a second location this spring at 176 S. Broadway in Denver. The 2,500-square-foot space will be almost identical to the original location at 3495 S. Downing St., said owner Johnny Ballen. The brand’s mascot — the pig — will remain the center of attention, and Ballen will re-create the eclectic design he said is unique to Cochino. Its original space features two colorful pig murals (painted by muralist Jeff Maxim) on the outside of its building, and Ballen salvaged a large Bevador beer cooler from 1948 for behind the bar. He’s gathered various tchotchkes to decorate the interior, including a large vintage lamp from a doctor’s office and string lights in the shape of pigs. The former owner of LoDo’s The Squeaky Bean, Ballen is no stranger to niche restaurant aesthetics. So when the 2,000-square-foot Englewood building — a former Phillips 66 gas station that had been vacant for about five years — was purchased in 2014, its new owners turned to Ballen. Ballen said he built the menu over time, aiming for both unique and expansive. In keeping with the brand’s mascot, Cochino offers four kinds of pork tacos: carnitas, pork belly, pork shoulder and fried pig ears. But the restaurant also serves tacos with chicken, seafood, veggies and beef, as well as salads and 13 cocktail options. Ballen said the restaurant’s most popular drink is its $8 frozen paloma, made with Arette Blanco tequila, red grapefruit, grapefruit soda and float of Aperol. The restaurant’s most popular drink is its $8 frozen paloma. The restaurant also offers a poblano queso burger, which won best hamburger in Westword’s “Best of Denver” 2017 contest. On South Broadway, Cochino’s is taking the space vacated by Gary Lee’s Pub & Grub, a motorcycle-themed bar and music venue that closed in November. Ballen said he purchased the remainder of the pub’s lease and signed an additional 25-year lease for Cochino. “We’ll try to buy the building down the road,” he said. Ballen said he hasn’t yet taken over the new space. 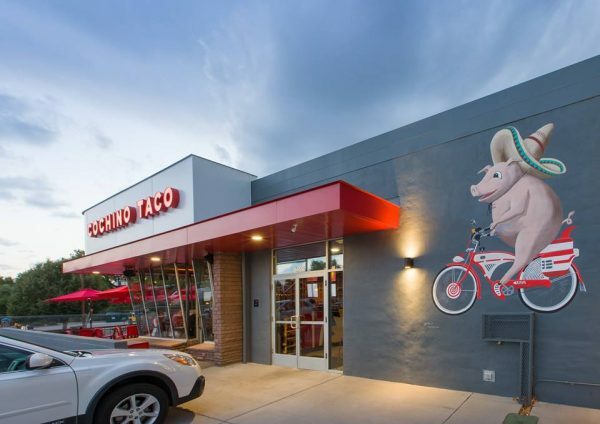 But when he does, he plans to hire a muralist to adorn the building with pig murals — he wants the second location to be consistent with the first, from menu to decor. 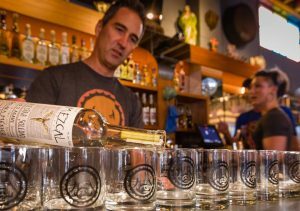 Cochino’s Englewood location employs about 30, and Ballen plans to hire a similarly sized staff on South Broadway. And he plans to keep growing. 1 Comment on "Englewood’s Cochino Taco to open second location along Broadway in Denver"
So excited for them! Although, I would like to mention that cochino means nasty or dirty in Spanish…in Mexico they often use cochino as slang for pig.